To keep up with the set international standards, we have incorporated the latest machines and cutting-edge technology to sternly examine the material used for production. We ensure on-time distribution of wholesale as well as retail consignments owing to an extensive vendor, distributor, and logistics facility base. 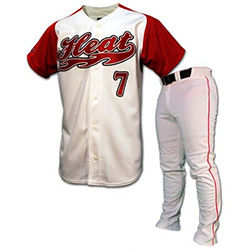 WB-1203 Baseball Uniform has a distinct design with a highly breathable fabric and a high durability.